Mike Pence is the bookies' favorite named insider to be the "gutless" wretch who wrote the "reckless" anonymous NYTimes op-ed from inside the 'resistance' with 2-to-3 odds according to MyBookie website. “What tipped us off was ‘lodestar,’ “ MyBookie head oddsmaker David Strauss said of Pence. Of course, Pence has vehemently denied that he is the "treasonous" insider, but there are 17 other named potential "traitors" listed by MyBookie, are: Education Secretary Betsy Devos (2-to-1), Secretary of State Mike Pompeo (4-to-1), Treasury Secretary Steven Mnuchin (4-to-1), chief of staff John F. Kelly (4-to-1), Defense Secretary Jim Mattis (5-to-1), Attorney General Jeff Sessions (5-to-1), Interior Secretary Ryan Zinke (6-to-1), Agriculture Secretary Sonny Perdue (6-to-1), Commerce Secretary Wilbur Ross (7-to-1) Labor Secretary Alex Acosta (7-to-1), HHS Secretary Alex Azar (8-to-1), HUD Secretary Ben Carson (8-to-1), VA Secretary Robert Wilkie (8-to-1), Homeland Security Secretary Kirstjen Nielsen (10-to-1), Ivanka Trump (12-to-1) and Jared Kushner (12-to-1). At 2-to-3 odds, a winning bettor investing $1 would profit 66 cents. At 1-to-3, a gambler wagering $1 would net 33 cents with a win. Given that NYT tweeted "he" about the author, we suspect the well-heeled gambler can discount Betsy DeVos, Ivanka Trump, and Kirstjen Nielsen. MyBookie places "A.N.Other" as the absolute favorite with the odds of the author of the op-ed not being on the list above at 1-to-3. 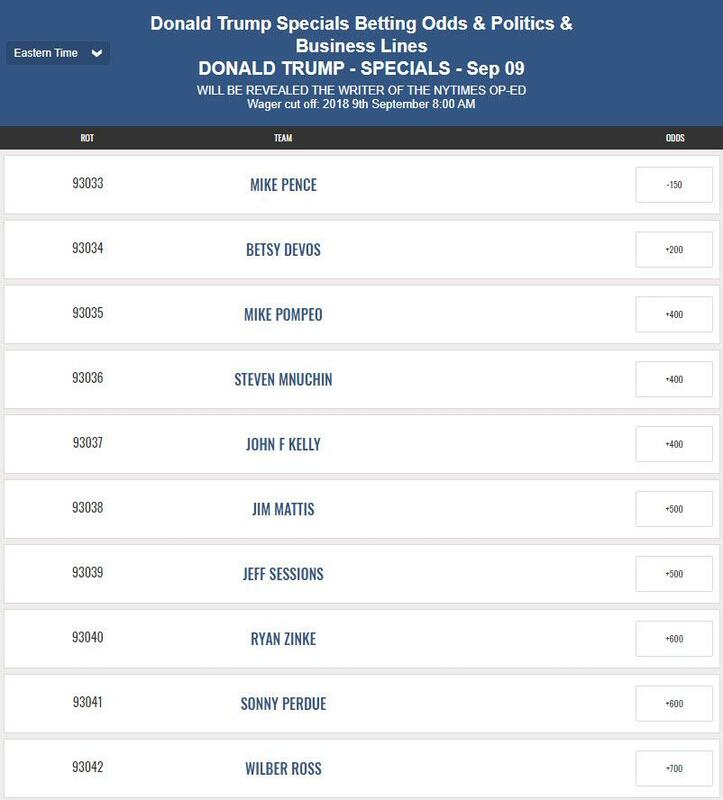 Additionally, as The New York Post reports, hours after MyBookie posted numbers, Canada-based Bovada issued its own Trump-leak odds and listed embattled AG Sessions as its favorite at 5-to-2. MyBookie also lists the odds for Trump charging the writer with treason at 1-to-2, notably more likely than Trump being impeached by 2020 at 3-to-1.